A rugged and challenging 5-10 mile hike with stunning panoramas of the central valley, ocean and neighbor islands. In a nutshell: A rugged and challenging 5-10 mile hike with stunning panoramas of the central valley, ocean and neighbor islands. Minuses: If you want to do the whole trail you’ll need 2 cars or legs of steel. – If you want to hike the whole trail, you’ve got three choices: 10 mile strenuous hike out-and-back, two cars (drop one at the ending trailhaed), or hitch-hike the return. Pali can mean cliff, precipice, steep slope or obstacle. All of these apply equally to this hike. The trail was hand-built in the 1800’s for horseback and foot travel between Wailuku and Lahaina. 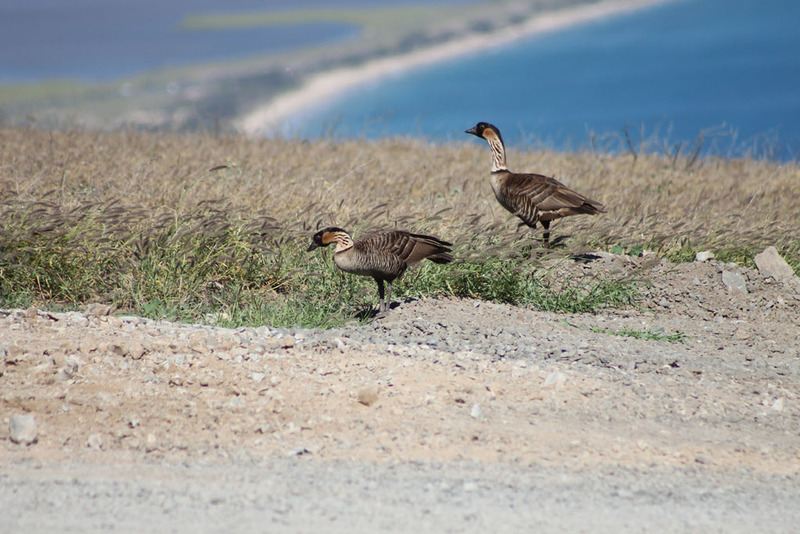 You may see native birds such as nēnē and pueo. There are many historical features. 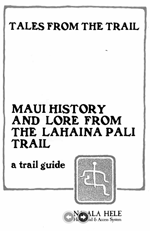 16 numbered markers along the trail leave most hikers scratching their heads – unless they picked up the “Tales From The Trail” guide from Na Ala Hele. (We made it easy, you can download it clicking on the thumbnail to the left.) I’ll skip restating these historical facts here, as the pamphlet is well researched and does a great job. The entire trail is though an area of very low rainfall. Most years, significant storms periodically bring just enough rain so that the parched hillsides temporarily explode with tall, green grasses. But when storms decrease in frequency, the grasses become brown, and very, very dry. This area is highly susceptible to huge uncontrollable brushfires which can be easily sparked by a single wind-blown ember. Unfortunately several gigantic fires consuming many thousands of acres have happened with some regularity in recent years. Fires on this side of the island can literally completely close off access to West Maui, sometimes for days. If you look, you will find charred tree remains from past fires. Never smoke or build a fire on this trail. This is also an area with reliably steady and strong winds. The winds will often keep you cool, but don’t forget your sunscreen and plenty of water! “poor owner management” LOL… FYI. KWP Phase 2 maintains a +95% availability rate ie: 95% of the time the Turbines are available to make power. however this does not mean that MECO (the Utility company that purchases KWP’s power) can use it all the time. due to the vast amount of unregulated (“unregulated” as in cannot be turned off or down) solar power on island it is very common during the day for MECO to curtail output from KWP 2 to zero output. you see, when everyone is at work during the day – they aren’t using the power their rooftop solar panels generate… you cant “turn off” a PV panel, if light hits it – it makes power. where does this power go if not used by the household? into the grid of course. Now, MECO first throttles down their generators to compensate for the excess power on the grid – but that is usually not enough – so they also have to “throttle down” KWP2 . THAT is why on a windy, sunny day – KWP2 doesn’t turn. when Phase 2 was built – rooftop solar was popular, but not nearly as huge as it is now. over the last 5 years, it’s exploded and now commonly, there is excess power being generated on the grid by what is known in the business as “distributed solar” from around 10AM to 3:00PM most days unless its overcast. if you have questions about the facility, please ask – I’m more than happy to answer any questions, provided they don’t delve into proprietary information. Having experienced some of Hawaii’s most beautiful hikes, this is not one of them…. while convenient from Wailea it is essentially walking along the highway. We walked by an old matress, shoes, garbage and an abandoned car at the beginning. We back tracked/aborted mission after about an hour and went to hike around the blow hole instead (1 h drive from there) and it was more challenging and much more beautiful. Hiked from the Lahaina side this morning. Went up to the road by the windmills and turned back. I am guessing that is halfway as the trail looked like it started to go back down. Took me 61 minutes to get to the top, and oddly enough, took me 57 to get back down (55 years old and not as flexible as I once was!). Great hike but the humidity was brutal!. Used about 48 ounces, would like to have had 64, but I also sweat above average. So glad I found this page. My girlfriend and I did an out and back- we went from the West side to ighway 30 and back three years ago. Beautiful hike and I highly recommend it. As others have said, good shoes and lots of water (and snacks) should be carried As I recall it took us about 4-5 hours to do the ~10 miles. We are both in decent shape (I am a 2:40 marathoner, she just ran a 2:50) and we got a good workout doing it! Thank you for the very detailed feedback regarding the Pali Trail. Definitely challenging and recommend that hikers allow enough time to make it back – in other words, don’t start too late. Mahalo! We started on the West side/Ukumehame (from Lahaina). From Lahaina, if you’re heading towards the airport, there’s a little unmarked parking lot on your left hand side right before the tunnel. Be aware that there are no bathrooms and no place to get water along the trail. Bring at least two large water bottles per person and hiking boots would be preferred over tennis shoes. We did this trail in June on a hot day and the steep elevation required us to take small breaks to catch our breath. The trail is mostly steep rocks and dirt. We are athletic people who underestimated this trail. It took us about 2 hours to hike up to the midway point (1600ft) from the West side (Ukumehame). Because we didn’t have enough water we decided to head back down the West side and that took less than one hour. The views at the top are incredible and if you plan right you can see a beautiful sunset. We dropped a car on the West side and then hiked up from the east side near Ma’alaea. It’s a beautiful hike with amazing views. Took us about 2 hours 10 minutes to go up and down – we are in pretty good shape but not regular hikers. Two things I didn’t see mentioned here: first, on the Ma’alaea side the dirt road to the trail head parking lot is really rough. I had a jeep but in a car you would have to just park by the highway. Second thing is that you don’t have to do this trail early in the morning! We went in the late afternoon (in June) and saw the sun setting on the way down the other side. It was gorgeous! Just be prepared with the best shoes you can find and plenty of water. Ran from the condos in Maalaea to the top and back, coming from the east side….well run means jog, scramble and walk, especially the middle section of the trail as quite steep and rocky. Started around 6.30 so not too hot but probably a two water bottle effort for those of us spending winter in the Seattle area. Lovely views from top and along the way. Saw a few hikers but not crowded at all. Diving in the ocean at the end a treat. Well worth it. My wife and I did this in January 2017. It is a tough hike, lots of boulder climbing, lots of loose stone. Coming down was more difficult as we were tired and there were a few slips. Definetly need good hiking shoes or boots for this one and plenty of water. 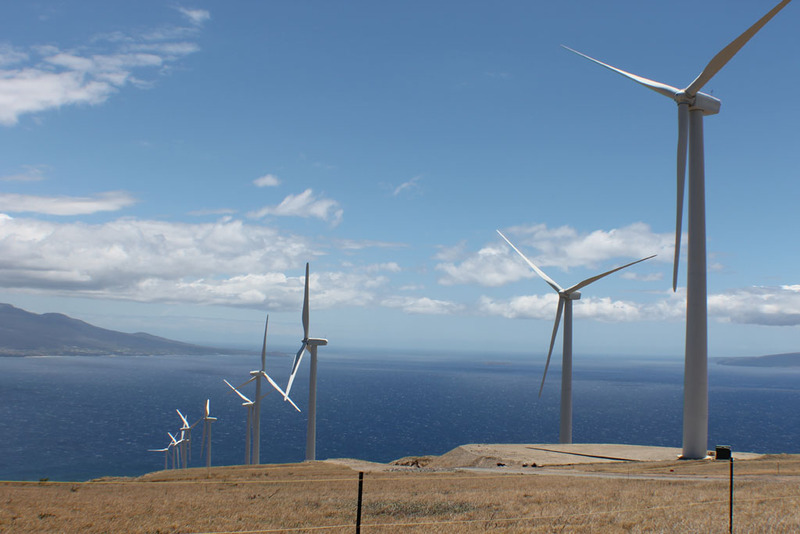 We did this hike on Friday June 30, and all the turbine were turning except one. What they do, is rotate the blade parallel to the wind, so it doesn’t catch the wind. It just moved slowly. The reason they turn some of the turbines off this way is that they have to match the electricity generated to the demand, since there is no way to store the power. It may be, also, that if you saw the farm in a very high wind, they may have turned them off to avoid damage from turning too fast. There is maximum wind velocity, beyond which the turbine can be damaged if allowed to run. But unless it was a severe storm, it was probably turned off due to low demand. The island grid can only handle so much power. That is why the turbines get curtailed by the power company not the turbine owner. M’Sis and I thought we would just take a look at the Lahaina Pali Trail yesterday (16Nov 2016) after an invigorating canoe outing with The Pink Paddlers. After about 45 minutes , a fellow hiker coming down told us we were only a third of the way! He kindly asked about our water supply, then very generously gave us his unopened bottle saying “I don’t want to read about you in the paper”. We continued for a while enjoying the view and taking breaks. Finally decided we were not intended to finish and will start earlier next time. We will also bring more water! All the years we have visited Maui, this is the first time we learned about being able to hike any of the Pali trail. Great Workout! Aloha! Thank you for the information in your site. Very thorough……the trail was amazing……I agree difficult and at some points steep but worth it even if you do half point …… Vistas of the ocean and sorrounding islands is awesome plus a great workout. I strongly recommend an early start given the digree of difficulty. A must do if your in Maui. The trail is very dry and windy. The brushfire remarks were interesting as the July 2, 2016 fire burned 6000 acres and did shut down highway 30 and knocked out power from Kehei to Lahaina. If this is a regular thing I would suggest possibly controlled burns to mitigate the problem. I have hiked this trail before and loved it! The winds up top are strong and exciting. Tomorrow I will try to run the Maalaea side and was searching for more information. Your site is terrific and I thank you for putting a link to the Tales from the Trail pamphlet on as well.